I've dropped some large Red Oaks in my yard on a hillside,would my 4110 be cabable of pulling some 28 to 24" Logs? I'm concerned that it would be to much for my Tractor.I've cut off the large log butts. Without knowing the diameter of the logs it is hard to venture an opinion. If it will pull a plow... and it will... it can certainly drag a reasonable size log if the leading end is off the ground. The total amount of weight placed on the 3 point shouldn't exceed the listed lift capacity. If the front end gets light grab a bucket full of dirt as a counterweight. You can try it and see what happens. I am thinking you will just spin the tires in place unless you cut the logs into very short lenghts. 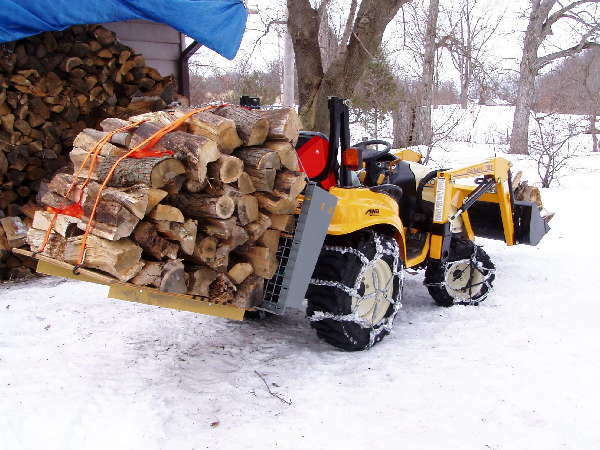 Depending upon the ballast weight of the tractor and traction conditions, you just may well be able to skid the logs. Can't hurt to try it and find out. I use a log skidding "chocker cable" that I purchased from Bailey's logging supply and mounted a trailer hitch ball on the draw bar and slide the loop of cable over the hitch ball, then skid the log. Good luck and take it easy and slow! If you do try this be sure to attach the chain/cable below the level of the rear axle. You don't want to be flipping over backwards if the log won't move or gets stuck. The above caution bears repeating. Many rear overturns are caused by skidding logs with smaller tractors. It is natural to chain the end of the log to a hitch-mounted drawbar, raise the hitch to lift the log off the ground, then take off. Trouble happens fast if that leading edge of the log catches an unseen stump or other obstruction; the tractor can flip in an instant. It tears up the ground more, but it is safer to just hook to the log with a longer chain attached low on the tractor, no higher than the regular drawbar. Weird question but could a wheeled log skidder (like the kind used for horse-drawn logging) work with a tractor? I've seen pairs of draft horses pull amazingly large logs with the help of these wheeled devices. I have pulled lots of logs with my JD 4310 using a flat drawbar with chainhooks between the two lift arms of the 3ph. I wrap a chain around the end of the log, attach the chain ends to the chain hooks, lift it just a few inches off the ground, and skid it right out. I have been able to skid some very large logs without much trouble. However, I move very slowly and pay close attention to the tractor and log, because of the possibility of problems as stated in this thread. Be careful.